What’s the Deal? 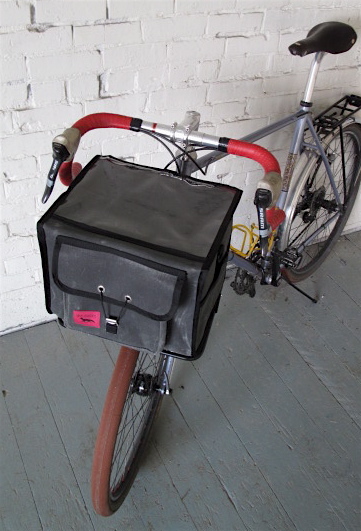 Haulin’ Colin and Swift Industries are offering rSogn owners a batch-produced Porteur Rack and Ozette XL combo deal. For one month we are offering dibs on this amazing combination. No foul play, no scalping slots–be gents, first come first serve. We will complete and ship the bags and racks in 10 weeks, so you can expect to see them by mid-March. Measurements: 12″ wide X 10″ deep. This is the only non-adjustable rack built specifically to fit the rSogn’s specially placed fork braze-ons. It is constructed of 3/8″ x .035″ 4130 chromoly tube. All joints are fillet brazed. It is finished with a professional satin black powder coat. The rack has many of the standard porteur rack features, including bent lightweight tubing construction, a backstop, a M6 threaded stud for mounting a Schmidt eDelux, B&M Cyo, or similar light on the right leg, and a M5 fender mount on the center strut angled to directly face the axle. Radiating the central rails from the crown mount stiffens the platform without requiring additional stays or Kogswell-style mounts on the shoulders of the crown. “Breezer-style” counterbored screw mounting points are stiffer than typical plate tabs. Readers of the Rawland Cycle Owners’ Google Group will be familiar with a recent design change. The backstop will now be integrated with the V-shaped center rail assembly, allowing it to move back about an inch. The whole platform moves an inch back with it, maintaining the 10″ deep dimension. This change puts the bag as close in to the head tube as possible. The pictures here were taken with a rack from the first batch, but you can see a picture of the new prototype here and here. The Swift Industries’ Ozette XL is a randonneur-inspired front bag designed specifically to accompany Haulin’ Colin’s rSogn front rack. rSogn owners may choose either an elegant charcoal waxed canvas bag with black thread and trim, or a durable and well-matched black Cordura bag with burgundy front and rear pockets (the weight saver). 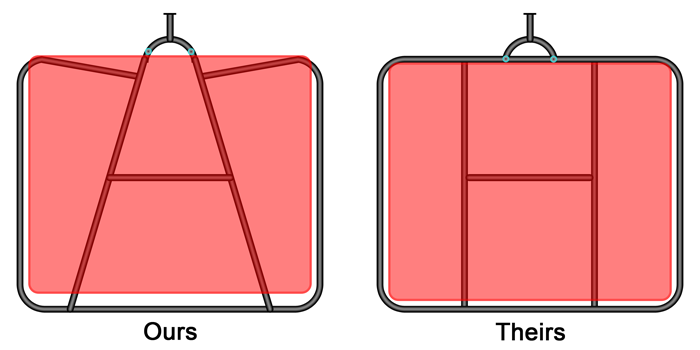 Three pockets with overlapping flaps offer access to your personals (wallet, phone, lipstick tube, blackberry, tire levers, 3-d glasses etc). 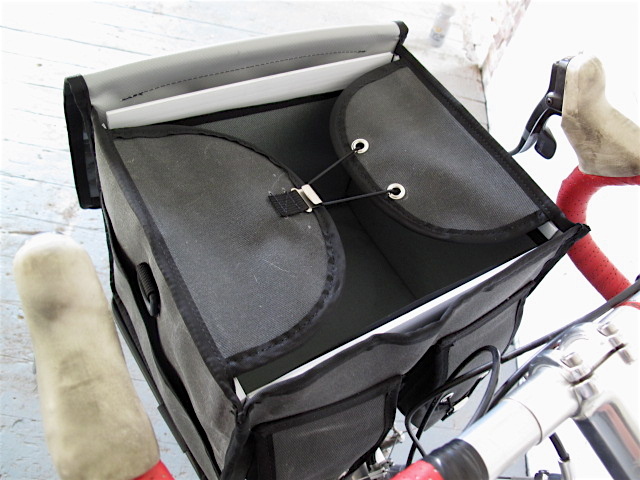 The side panels offer a flat pocket and built-in dee rings. Each Ozette XL comes with vinyl lining and a clear map case which measures 12″ X 9″. Cyclists enjoy Swift’s simple eyelet & hook closure system on all external pockets, and the internal wings which deter water from entering the bag in blustery weather. The Ozette XL opens from the rider out so you never need to dismount your rSogn again. The bag maintains it rigidity with removable coroplast inserts. How does the Ozette XL attach to Haulin’ Colin’s rack? The Ozette XL matches the footprint of the platform perfectly. 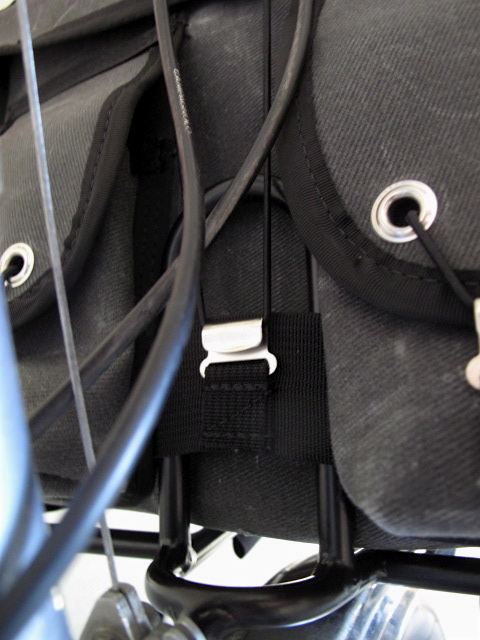 Three velcro tabs prevent the bag from moving laterally on the rack (1. front middle, 2. left side, 3. right side) , while held steady by the vertical back-stop on the rack. head to flickr for more photos! 558 1st Ave South, 2nd Fl.